Spend a busy day with Olivia. Join Olivia as her big dreams lead her through another busy day. 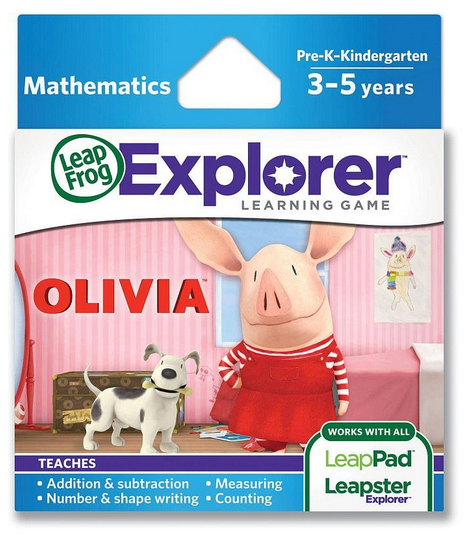 Explore her world and daily routines as you play 4 math mini-games all about Olivia. Do you have the energy to keep up with Olivia? Teaches counting, addition and subtraction, number and shape writing and measuring appropriate for children ages 3 to 5 years (pre-K to K). 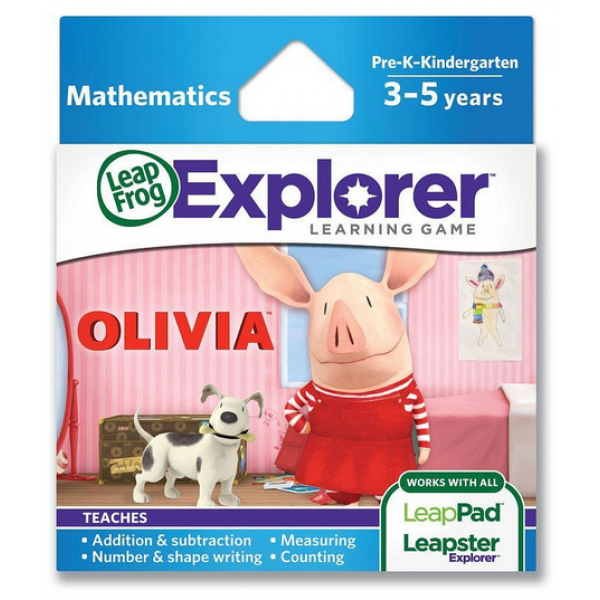 Works with LeapPad learning tablets and Leapster Explorer game systems, not with Leapster or Leapster 2 game systems. Olivia invites preschoolers into the life and daily routines of an imaginative, creative little girl. Routines are important for young children since they help them feel safe, guide their expectations and provide a sense of control. Olivia takes you along on her adventures, and incorporates daily activities such as getting dressed, brushing her teeth or painting a picture. Children also practice counting and comparing sets of objects, identifying numbers, adding and subtracting and measuring ingredients. Olivia also includes a fun dress-up game, where children get to dress Olivia in different outfits, take a picture of Olivia and then see the picture appear in Olivia's room. This type of gameplay teaches cause and effect, where kids get to see the results of their actions, and provides a sense of ownership and empowerment to children. Olivia features simple gameplay designed to promote engagement with young audiences, including one-step directions, highlighting icons to click on, and free-play. Four math mini-games are presented with easy-to-follow graphics. The games are auto-leveled based on each individual child's performance, and children can level down if they need more support. In addition, tutorials help teach children underlying concepts. For example, in Olivia's paint-by-number game, younger children paint works of art by finding the right number of dots. As children grow to recognize numbers, they paint works of art by finding the right numerals. At even more advanced levels, they paint by doing addition and subtraction.